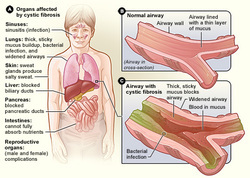 Cystic fibrosis is an autosomal recessive disorder which affects the transport of the water and chloride in epithelial cells across the chloride channel. Cystic fibrosis may occur due to mutation on chromosome 7. Patient with cystic fibrosis may present with collection of symptoms, signs and disorders which include cyanosis, pancreatic insufficiency,productive cough, bronchiectasis, infertility in male, malabsorption and meconium ileus ( newborn may suffer from small bowel obstruction). There will be a defective in the chloride ion channel membrane ( CFTR). This will lead to the secretion of the mucus which will deposit and lodge into the pancreas, lung and liver. In the pancreas, the thick mucus may obstruct the pancreatic ducts and cause a fibrosis of the exocrine glands. In the lung the thick mucus may obstruct the airway ( bronchioles). In the liver, the mucus plug may cause biliary cirrhosis and obstruction of the bile canaliculi. Patient may present with high concentration of chloride ion in the sweat test. The treatment of cystic fibrosis may includes, physiotherapist assistance to clear the airway from secretion, antibiotic and bronchodilators.